RALEIGH — A solo exhibition of large scale paintings by Davidson artist Herb Jackson is now on view at the Duke Energy Center for the Performing Arts in downtown Raleigh. The exhibition, courtesy of Lee Hansley Gallery, opened December 6 and runs through Feb. 26. 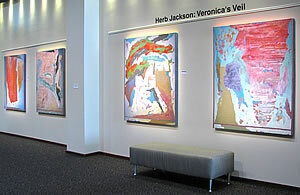 All twelve paintings are from the Veronica’s Veil series, a group of paintings Jackson has been making since 1979. There are now 225 paintings in the series. The paintings are 60 by 48 inches and are made from many layers of acrylic paint with pumice which is scraped away after being applied. A painting evolves through this excavation process.The exhibition was mounted by the gallery in cooperation with the Performing Arts and Convention Center Commission, the body which administers the McCain gallery. The gallery is located in a large space between Memandi Concert Hall and Raleigh Memorial Auditorium. It is open by appointment and before, during and after performances. At the opening reception on Jan. 23 the artist was presented with a special commendation from the City of Raleigh presented by Mayor Pro Tem John Odom. The commendation cited Jackson for his 42 years of teaching at Davidson College, much of that time as chair of the art department. It also noted that his works are in over 100 museum and public collections. Jackson, who was awarded the North Carolina Award in 1999, has had solo exhibitions in the United States, England, Peru, Portugal and Canada. An illustrated book on the Veronica Veil series is available at Lee Hansley Gallery. For more information on the show, contact the gallery at 919.828.7557.